Haswing Marine USA is a professional trolling motor maker with manufacturer based in Mainland China. Our products are known to have high quality; great performance and more features in an affordable price compare to the others. 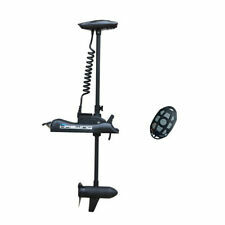 Protruar 85 lbs transom mount trolling motor Freshwater & Saltwater. 10 levels of tilting position allows the user to adjust the angle of the motor to create a secure motor-to-transom lock. It is suitable for different type of transom. This trolling motor runs smooth with two 12-volt Deep Cycle battery and it is suitable for boats weighing up to 4,000lbs. If you turn the motor 180 degrees of rotation and it will push the boat in reverse direction. 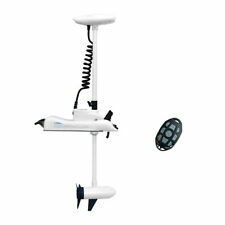 White Haswing Cayman 24V 80LBS 48" Shaft Bow Mount Electric Trolling Motor with Wireless Remote. This trolling motor runs smooth with two 12-volt Deep Cycle battery and it is suitable for boats weighing up to 4,000lbs. Haswing COMAX Electric Trolling Motor - Power Lift. 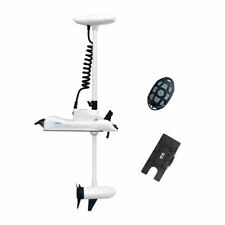 HASWING’s EasySet bracket system allows you to adjust the height of the motor on the transom without tools and you are even able to swing up the entire motor to remove weeds without leaning over the side of the boat. 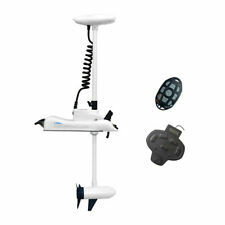 White Haswing Cayman 12V 55LBS 48" Shaft Bow Mount Electric Trolling Motor with Wireless Remote & Quick Release Bracket. This trolling motor runs smooth with two 12-volt Deep Cycle battery and it is suitable for boats weighing up to 4,000lbs. ❄ The PROTRUAR 85LBS transom trolling motor can easily be tilted in and out of the water when the depth or fishing condition change, and the shaft height is adjustable by way of a quick lock, so you can deploy motor in virtually any water. Haswing Motor is a professional trolling motor manufacturer based in Mainland China. Our products are known to have high quality; great performance and more features in an affordable price compare to the others. Trending at $541.00eBay determines this price through a machine learned model of the product's sale prices within the last 90 days. Peak Thrust in Lbs： 55Lbs. The 55 LBS motor is suitable for all transom small boats. If there isn't a shaft in that size then round up. 10 levels of tilting position allows the user to adjust the angle of the motor to create a secure motor-to-transom lock. 360 - degree turn provide smoother course corrections and tighter heading accuracy against wind, waves. Our extra large windings and commutators dissipate heat, resulting in cooler operation, extended battery power, and longer motor life. Download the free version of Helmsman System with live real map. Makes fishing easy with smarter user interface on the bright touchscreen. Helmsman holds tight to the fishing spot like an electronic anchor. This trolling motor runs smooth with two 12-volt Deep Cycle battery and it is suitable for boats weighing up to 2750 LBS. If you turn the motor 180 degrees of rotation and it will push the boat in reverse direction. Propeller for 20 lb Haswing Trolling motor. Propeller for 20 lb Haswing motor. A validRMA number must be requested online before you sending the item back to us. 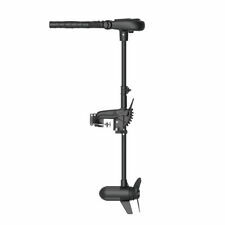 Black Haswing Cayman 12V 55LBS 54" Shaft Bow Mount Electric Trolling Motor with Wireless Remote & Quick Release Bracket. This trolling motor runs smooth with two 12-volt Deep Cycle battery and it is suitable for boats weighing up to 4,000lbs. Black Haswing 12V 55LBS Transom Mount Electric Trolling Motor. Peak Thrust in Lbs： 55Lbs. The 55 LBS motor is suitable for all transom small boats. If there isn't a shaft in that size then round up. Fhising Kayak 40LBS HASWING TROLLING MOTOR OSAPIAN SALT/ FRESH 12V 50702! Haswing is a professional trolling motor maker with manufacturer based in Mainland China. Our products are known to have high quality; great performance and more features in an affordable price compare to the others. 5 out of 5 stars - Fhising Kayak 40LBS HASWING TROLLING MOTOR OSAPIAN SALT/ FRESH 12V 50702! 1 product rating1 product ratings - Fhising Kayak 40LBS HASWING TROLLING MOTOR OSAPIAN SALT/ FRESH 12V 50702! Supplied standard with all the necessary hardware for mounting to fit straight onto the boat, or gear up with our quick release plate with a foot print of just 120mm x 200mm when not in use. Shaft Type. NEW NEVER USED OUT OF THE ORIGINAL BOX. The integrated Osapian electric outboard provides a generous amount of propulsion, and the tilt rudder trimsystem allows forsmooth beach landings. All you need is a battery and you are ready to go ! Thrust in Lbs： 55Lbs. It is light and easy to carry. This trolling motor runs smooth with two 12-volt Deep Cycle battery and it is suitable for boats weighing up to 4,000lbs. Our trolling motor is designed and engineered to run quieter than ever before. Black Haswing Cayman 12V 55LBS 54" Shaft Bow Mount Electric Trolling Motor with Wireless Remote. This trolling motor runs smooth with two 12-volt Deep Cycle battery and it is suitable for boats weighing up to 4,000lbs. You are buying a very Nice set of 316 Stainless Steel Bow Shackles with 800KG (1700 ponds) of lifting power. The sized marked on the shackle is 5/16". These shackles are NEW and never used. The screw in pin is 7/8" long. This prop replaces Haswing Weedless Wedge part. Engine Mount ： 24V 80lbs Bow mount trolling motor. With this number you can trace your item online. Convert a bow-mounted to transom trolling motor. FOOT PEDAL controller for CAYMAN 55 lbs or 80 lbs BOW MOTOR TROLLING MOTOR. NEW HASWING foot pedal controller for BOW MOUNT TROLLING MOTORS - Trolling motors. HASWING foot pedal controller for CAYMAN 55 lbs or 80 lbs. Another very unique feature of this trolling motor is a tilting throttle handle with 10 adjustable positions. Adjustable handle allows it to be lifted almost 45 degree up, or all the way down, parallel to the motor shaft.